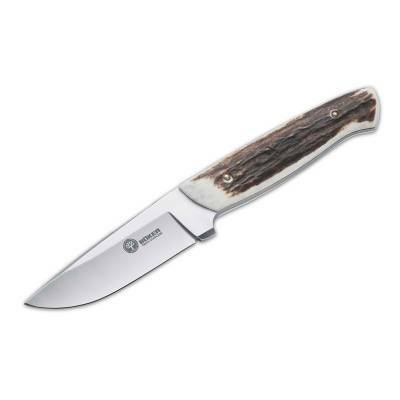 Boker Arbolito Stag Fixed Blade Knife with Leather Sheath. Traditional stag fixed 3-1/2" blade knife made of N695 stainless steel with a notched thumb ramp for stability and control. Handle is premium stag scales with a tapered tang for a comfortable grip. Comes with a high-grade leather sheath. Blade length 3-1/2". Overall length is 7-1/2".